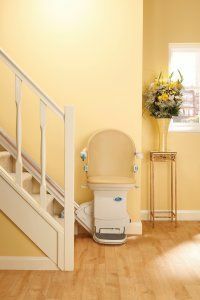 Using a swivel seat at the top of the stairs this will give you everything you need in Stairlift Reliability and Comfort. The swivel seat is simple to control and provides a much safer dismount at the top of stairs. The control buttons can be fitted to either arm and with a key simple on/off switch to activate the switch makes the stair lift perfectly safe when it's not in use. The remote control buttons are supplied for the top and bottom of the stairs enabling more than one user. All our straight stairlifts are battery operated with an unobtrusive aluminium rail fitted directly to the stairs with no need for disruptive wall fixings. We can also accommodate the more awkward stairs by using a hinged or jointed rail section that will allow for those stairs with small landings or curves. A stairlift will give you back your freedom and keep you in your own home. A curved stairlift is designed specifically to perform with curved or intricate staircases; it deals effortlessly with bends, landings and corridors. Quiet and unobtrusive the seat and footrest can be folded away making sure there is plenty of room to use the stairs normally. The swivel seat can be manually operated or the addition of a powered swivel will be enable the safe use at the top and bottom of stairs and allow you to get on and off more easily. Rail section fit directly to the stair treads with no wall fixings, remote controls are supplied for the top and bottom of stairs to enable one or more user and the battery back up makes sure you are never stuck during travel in the event of a power cut. A choice of upholstery colours are available to match your decor and with minimum fuss and disruption a stairlift will give you back the freedom of your own home. All our curved stairlifts come with 12 months warranty parts and labour, 2 service visits during the first year and a 24 hour emergency callout service 7 days per week. We can also offer reconditioned curved stairlifts which will have a re- manufactured rail and using a reconditioned carriage. We can also supply a wide range of reconditioned straight stairlifts that come with all the features of the new models. All our stairlifts are subject to home visit and availability.